History: Lawton Park was bought to be used as an Indiana State Fairgrounds in 1866, (it was called Northside Park until the turn of the century). In 1918 Lawton had 40 acres and along with Swinney remained one of the city's largest parks for many years. 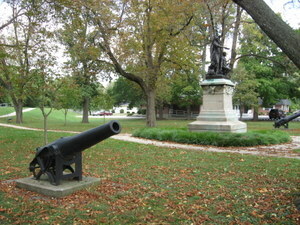 Cannons became part of the Lawton Park scene in 1901. Kids Crossing is one of the city's greatest children's playgrounds. 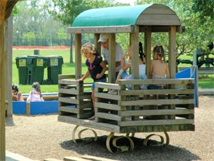 The playground is a scaled version of the original fort which serves as the backdrop for the playground. 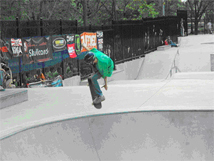 Lawton Skate park offers a 20,000 square foot facility, has 9 tons of reinforced steel, 500 cubic yards of concrete, and is lit at night (requires a button to be pressed) until the park closes. The park is surrounded by an 8' fence and has one turn-style entry at the east side. The Lawton Park Greenhouse has been a fixture of the Fort Wayne Parks and Recreation Department since the early 1920's. 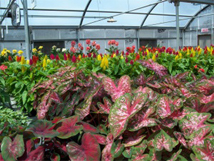 Employees at the greenhouse are responsible for growing over 130,000 plants for all of the Parks Department floral needs. 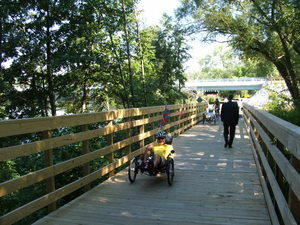 The Rivergreenway Trail is a 24 mile long linear park in Fort Wayne, Indiana. 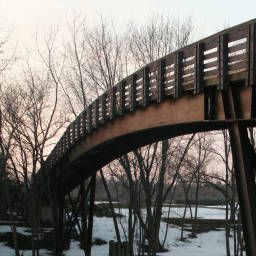 The Trail is along the banks of the St. Marys, St. Joseph and the Maumee Rivers. The Rivergreenway trail is your opportunity for recreation, fitness and conservation while getting away from it all while still being linked close to everything. The Historic Old Fort is a replica of an original structure under the command of Major Whistler. The new facility functioned as a living history museum offering a colorful first-person interpretation of life in the untamed "west" in 1816. 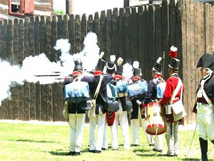 Historic Old Fort is committed to offering public events throughout the year. 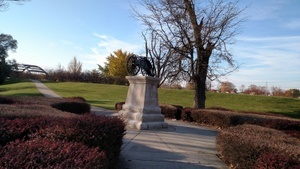 Above are photos of the monument to Civil War Veterans and two cannons located across the river on the east side of Lawton Park. 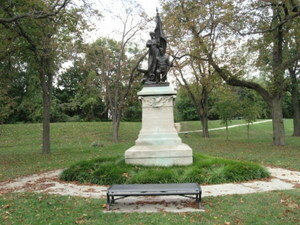 The nationally renowned restoration company, Conservation of Sculpture and Objects Studio (CSOS), based in Forest Park, IL has completed the restoration of the Philippine Gun Mount Monument in Lawton Park. CSOS transported the cannon from Lawton Park to Forest Park earlier in 2016 where they completed a restoration of the small metal cannon. The entire surface of the cannon was severely corroded and the bottom of the barrel completely missing due to the corrosion from water damage. 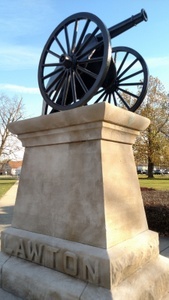 The cannon was transported back to Lawton Park and has been re-installed on its limestone base. CSOS will also clean and repair the base as part of the restoration process. 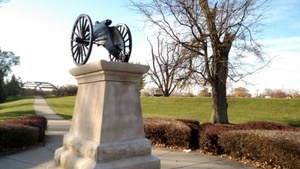 The Parks & Recreation Department has committed funds each year for the care and maintenance of monuments throughout the Parks’ system.